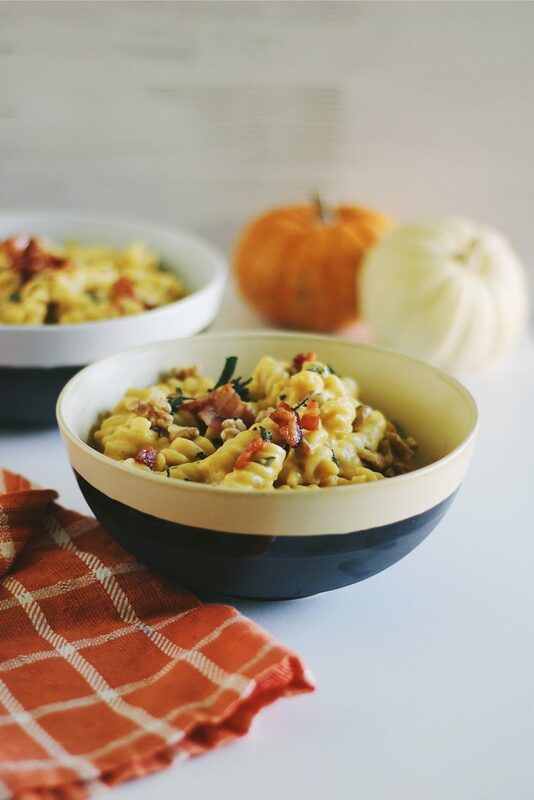 This Pumpkin Bacon Mac and Cheese is an easy, decadent fall dish. It’s ultra creamy, comes together right on the stove-top, and is laced with your favorite autumn flavors. Like 99.9% of the world, I love mac and cheese. Heck, even if you’re vegan or gluten-free, you love mac and cheese. It’s one of the most nationally recognized comfort foods out there. 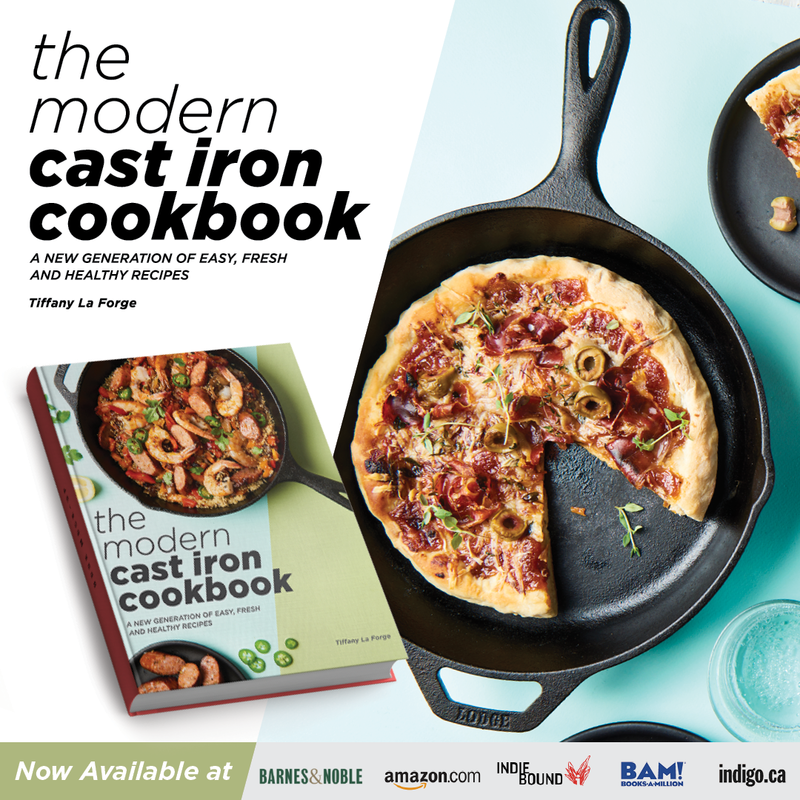 I’ve had it vegan-ized, gluten-free, lightened up, and in countless variations with numerous additions. And it’s great every time. It’s the perfect base for letting your imagination run wild, really. On the blog alone, I’ve made Vegetarian ‘Cheeseburger’ Mac and Cheese. 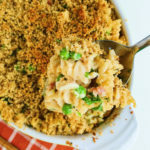 Lightened-up cauliflower macaroni and cheese with peas and pancetta. A butternut squash and fried sage version. 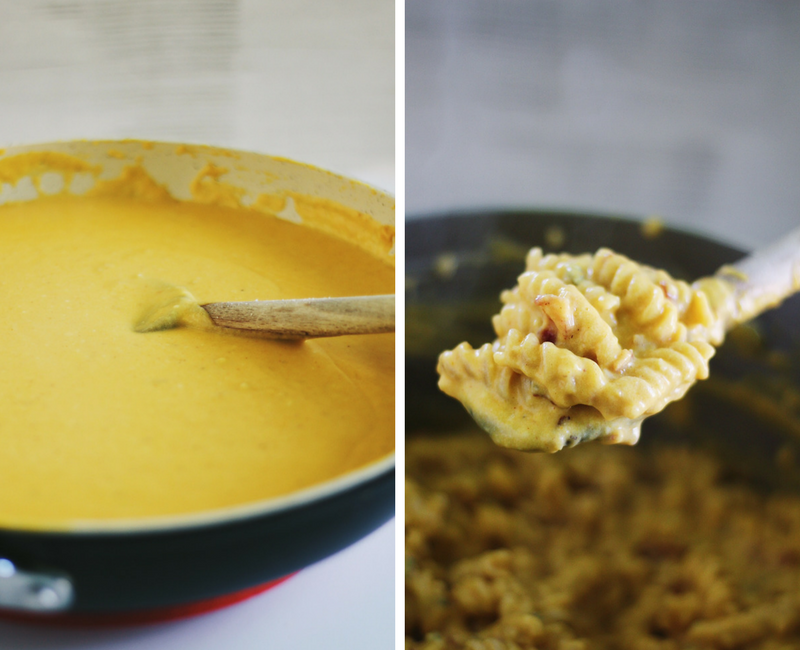 And now, of course, this Ultra Creamy Pumpkin Bacon Mac and Cheese. As you may be able to tell, sneaking veggies into mac and cheese is my jam. 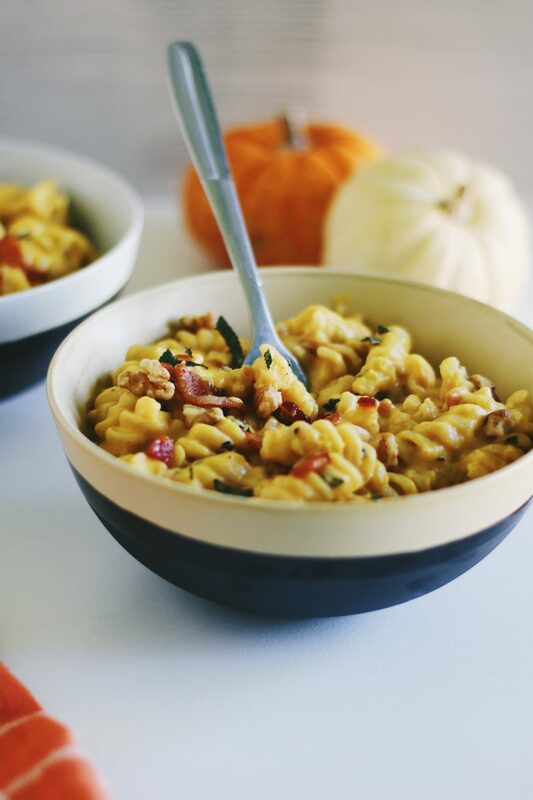 I wouldn’t exactly call this Pumpkin Bacon Mac and Cheese ‘light,’ but it is healthier than your typical version. 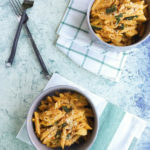 Here, we use fiber-packed whole wheat pasta, no cream, and heart-healthy pumpkin. Savory bacon and fresh, fragrant sage lace this dish. The sauce combines creamy pumpkin, milk, medium white cheddar, nutty Parmesan, and a touch of Dijon mustard, paprika, and nutmeg. And it’s crazy creamy, rich, and comforting to the max. It’s also not too sweet, which can sometimes happen with pumpkin pastas. The salty bacon, nutty cheeses, and sharp Dijon keep things savory. We also don’t go nuts with adding pumpkin pie spices, just a dash of nutmeg which is always welcome in any creamy pasta dish to add a touch of earthiness. 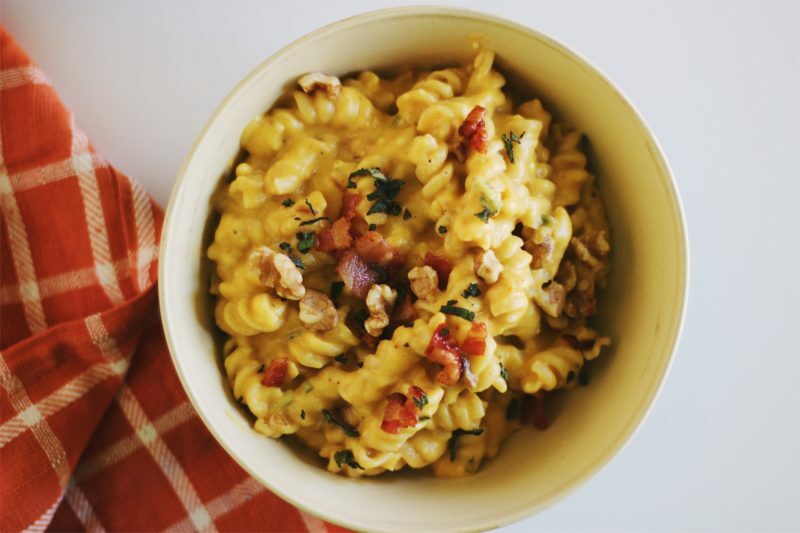 To top off this bowl of Pumpkin Bacon Mac and Cheese, we sprinkle some toasted walnuts for a bit of texture and crunch. 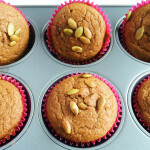 Creamy, pumpkin-y, autumn goodness, coming atcha. 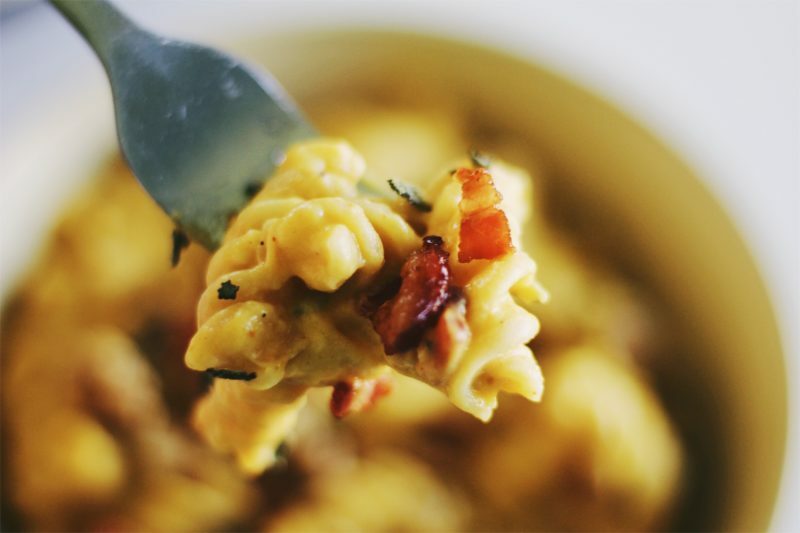 I hope that you make and enjoy this comforting, ultra creamy Pumpkin Bacon Mac and Cheese! 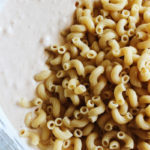 What are your favorite macaroni and cheese variations? Let us know in the comments below. 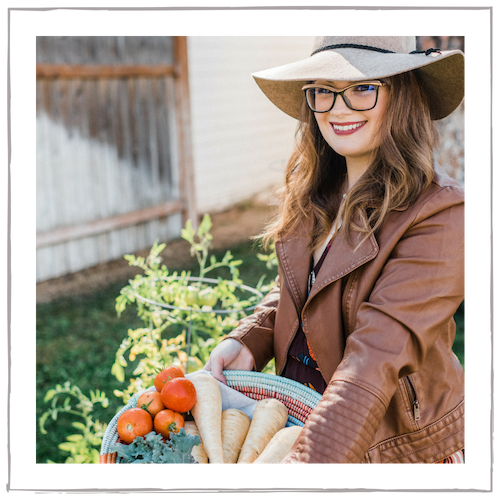 This post contains affiliate links and are always products I love, highly recommend, and use in my own kitchen! In a deep saute pan, cook the bacon until crispy over medium heat. Using a slotted spoon, transfer the crispy diced bacon to a paper towel-lined plate. Carefully pour the bacon fat into a small bowl. Lower your heat to medium-low and add 1 tablespoon of bacon fat back into the pan. Cook the shallots until softened and beginning to caramelize. Once the shallots are cooked, add in 2 tablespoons of butter and 2 tablespoons of bacon fat. Melt until bubbly, and stir in the flour. Cook the roux mixture until a bit deeper in color to cook out the flour taste, about 5 minutes. Add the pasta to the salted, boiling water and cook until al dente. To the roux, slowly pour in the milk, whisking or stirring constantly while pouring to avoid lumps. Once the milk is completely incorporated, season to taste with sea salt and pepper. Allow the sauce to gently simmer and thicken slightly. Stir in the pumpkin, paprika, Dijon, and nutmeg. Bring back to a simmer, and slowly stir in the Parmesan and cheddar cheeses. Stir the sauce until the cheese has fully incorporated and melted, and the sauce has thickened. Turn off the heat, and stir in the sage. Drain the cooked pasta and return back to the pot. Pour the cheese sauce over and gently stir the pasta and sauce until completely combined. Stir back in the crispy, cooked bacon, reserving a bit for garnish. 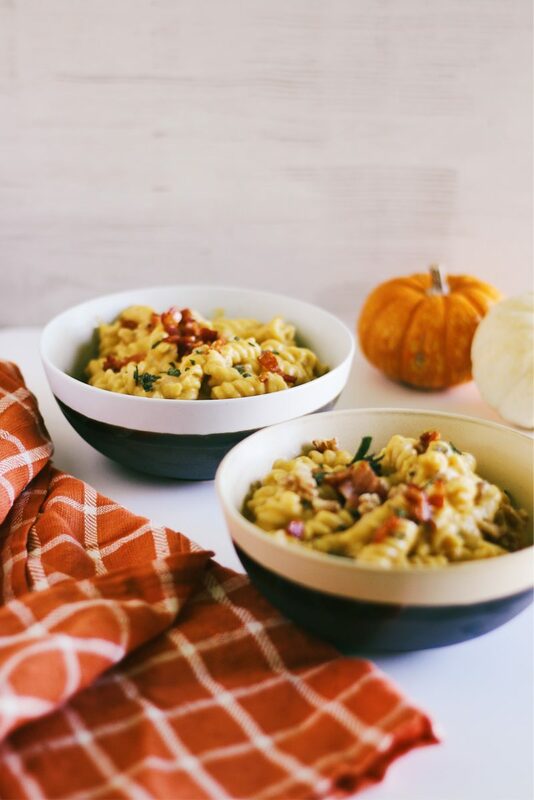 Divide the Pumpkin Bacon Mac and Cheese between bowls and top with additional bacon, fresh sage, a sprinkle of Parmesan, and a tablespoon of chopped walnuts (if using). Enjoy! *I used an 8-ounce package of bacon (Applegate Naturals® Sunday Bacon) and I got plenty of bacon fat for the recipe (about 6 tablespoons, of which I only needed half). If for some reason your bacon doesn’t render enough fat, just replace it tablespoon-for-tablespoon with additional butter. After trying this, it’s pretty much the only way I will eat mac and cheese now. The creaminess is just next level in comparison to regular mac. This is by far one of my favorite recipe’s of yours! Salty bacon and sweet pumpkin are a match made in heaven. And paired together with Mac and Cheese, it’s just absolute heaven! Wow! This looks really delicious. I am going to have to try this asap. LOVE comfort food. Oh this definitely sounds amazing! I love pumpkin and bacon and cheese together and mac & cheese is basically my love language. Thanks for the idea! I love mac and cheese and love that you incorporated all the fall flavours!! Pinning this to make later! There is NEVER a wrong mac n’ cheese. I am a bacon loving, pumpkin lover …. so THIS is PERFECT!!. Comfort food season here we come. Oooooh, this mac and cheese! Its like a fancy adult version of a creamy, comforting bowl of deliciousness! 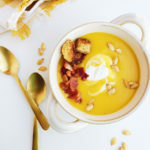 Love the addition of bacon and pumpkin! I don’t eat meat but back when I did, I would have never thought of mixing pumpkin and bacon. Lol good different choice. This looks and sounds delicious! I would love to try making this for my family sometime. Thanks so much for sharing. 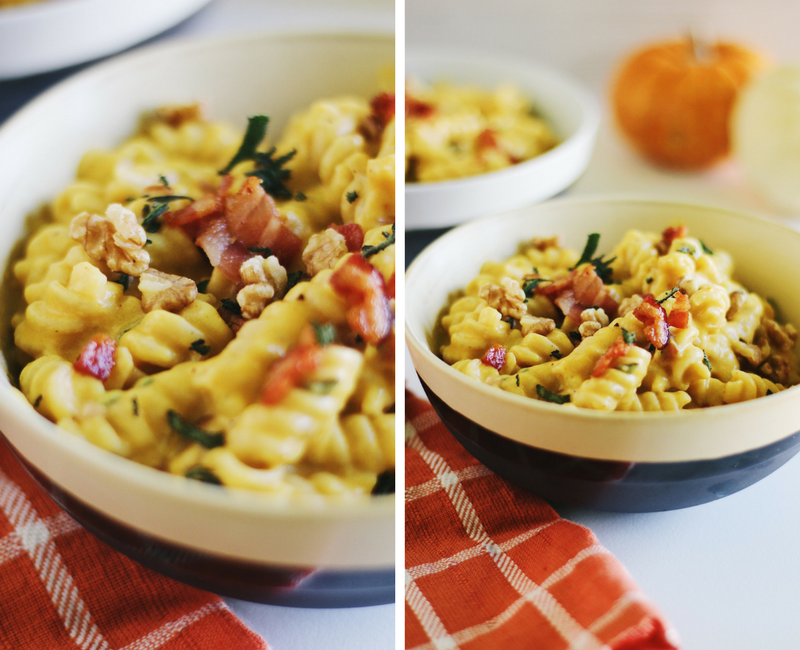 This pumpkin bacon mac& cheese sounds amazing and I will have to try making it for the family. I don’t know about adding the Dijon mustard though but I know this will be a interesting dish my family should like. Thanks for sharing the recipe. I love making mac and cheese into a full meal. You can add a lot of things like sausage and create a whole new dish. While I reading your article. It makes me feel so hungry. 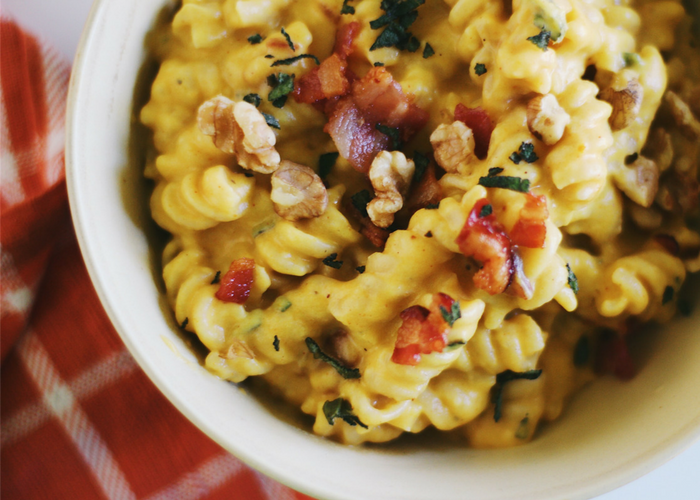 This pumpkin bacon mac and cheese looks so delightful and tempting. I will definitely try to make this recipe on our thanksgiving. Okay I am completely feeling hungry just reading the ingredients. Delicioso! I will save your recipe, okay? This sounds interesting. I would have never thought of using pumpkin for mac and cheese. May have to try it. This dish looks delicious. Seems easy that I can even make it !! My children would like it to have to save your recipe. This looks like heaven! A recipe thats elegant enough for adults but my kids will love. And I can sneak in pumpkin and they’ll love it. My husband and my daughter just love any food with a pumpkin flavor to it. I am sure they would really enjoy this recipe! Pumpkin! 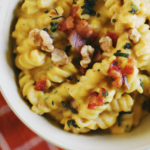 I never would have considered adding pumpkin to mac & cheese but this sounds so delightful! My family is huge fans of pumpkin everything. I’m only party sure I’ll be willing to share with them though. 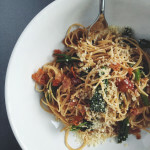 I love pasta and this one looks so delicious!! A good recipes for the Thanksgiving dinner! I’m a mac and cheese lover, and a bacon lover so this is just fantastic. Definitely trying this recipe. I love butternut squash and pasta. So this one sounds good to me to try.